Carte Physique et Politique de L'Italie dela Region des Alpes et des ProvincesAutrichiennes sur L'Adriatique. 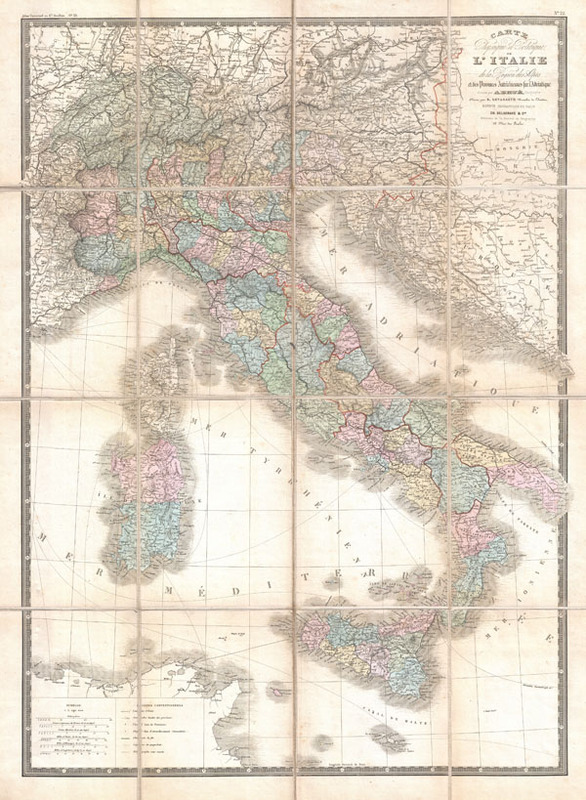 Adrien-Hubert Brue (1786 - 1832) was a French cartographer active in the late 18th and early 19th centuries. Brue held the office of Geographe du Roi and often signed his maps as such. In this position Brue contributed to thousands of maps and numerous atlases. Like most cartographers many of his maps were published posthumously and were common even several decades after his death.kable clarity and accuracy. Brué eventually acquired the prestigious office of Geographe du Roi and often signed his maps as such. In this position Brue contributed to thousands of maps and numerous atlases. Like most cartographers many of his maps were published posthumously by his partner, Charles Picquet's son and heir, Pierre-Jacques Picquet, and were still being updated and republished decades after his death. Levasseur, E., Atlas Universel en 67 Feuilles, c. 1870. Very good. Light toning on original folds. Dissected and mounted on original linen in 16 sections.